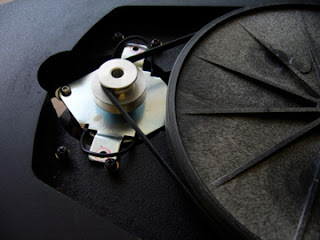 Enjoy life with LP's and Turntables: Upgrading Pro-ject P1.2 with motor isolation base ??? Upgrading Pro-ject P1.2 with motor isolation base ??? 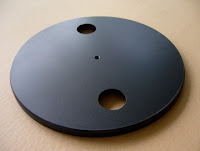 I was surprised to receive an interesting enquiry from a non-Rega turntable user : " Can your motor isolation base be used on my Pro-ject P1.2 turntable?" 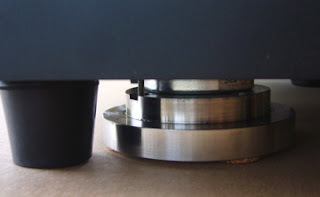 Generally speaking, I find many Rega turntable owners are still quite sceptical about this unconventional upgrade of isolating motor vibration though the concept of out-board motor is actually nothing new to any turntable lover! Fortunately, I still have my old Pro-ject P1.2 which is collecting dust in my store-room. I am happy to take it out to test with my motor isolation base upgrade. 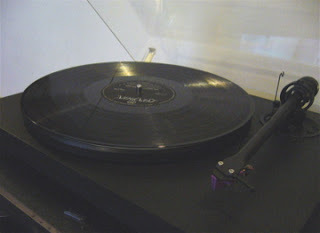 At a glance, Pro-ject P1.2 looks quite the same as Rega turntable, but with thicker fiber-board plinth. 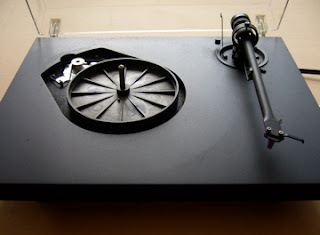 Surprisingly this budget turntable comes with a heavier alloy platter(~2.4 kg). 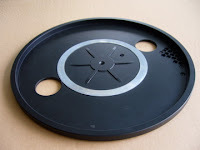 The plastic sub-platter is of bigger diameter and thus the aluminum pulley too. 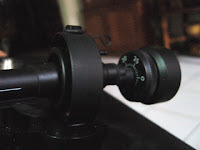 The suspended motor mounting is quite similar to that of Rega Planar 2 and Planar 3 i.e. 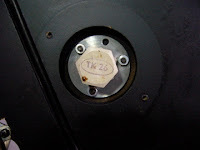 it is mounted to a metal top plate which is held in place with rubber band to the plinth. 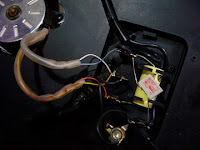 This way of mounting is not ideal as when the motor runs, it wobbles at the same time. This causes a slight speed variations which in turn affects the quality of sound tracked by the cartridge. Removing the motor, I find it fits the motor isolation base perfectly. 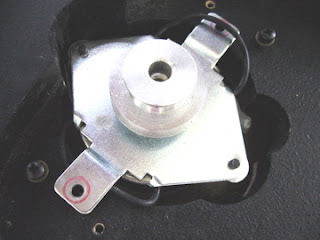 The problem is: the original motor flanges sit directly on the plinth, in the small "motor compartment". 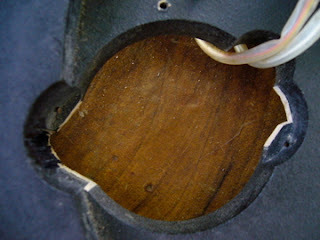 Clearly, this part of the plinth (in the motor compartment) has to be trimmed slightly (as shown) in order that the motor (with the base), would not contact the plinth. 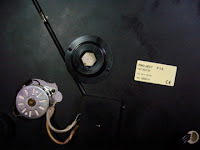 Putting the motor back into the motor compartment (after the trimmed part is darken with a marker pen). Check to make sure the motor (already secured with screws onto the motor base) is not touching the plinth. Align the pulley before putting on the rubber belt. 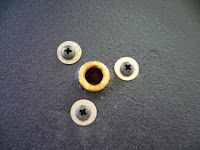 Change the rubber feet to accommodate the height of the motor isolation base. 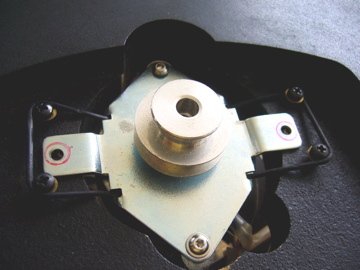 For transportation, the motor (with motor base) is held with the existing rubber band and the metal bracket with transport screws. No rubber mesh netting is required. 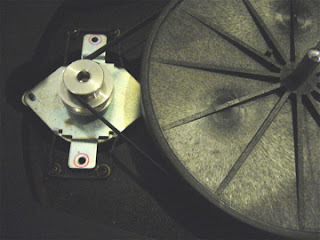 The Pro-ject P1.2 with motor isolation base upgrade is ready to run. After playing a few familiar lp's, I notice substantial sonic improvement with lower noise floor and clearer details. The stylus can track better now in the absence of motor vibration and speed shifts due to suspended motor mounting using rubber band. So what's is the answer? Why not let you decide yourself !